There are no "typical job costs" since my work runs the Spectrum from a simple consult to a full Bathroom or Kitchen remodel. 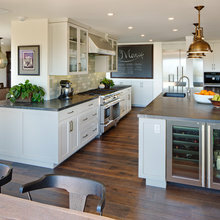 I am an Interior Designer who specializes in helping people redesign spaces. 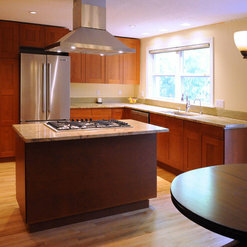 The bulk of my work is really kitchen and bathroom remodels. For those who want to "live in their homes for life", I can help you plan and design solutions that will work for you for the next 10-20 years, or simply to sell and move on. If you are planning a remodel, think about your plans for the future. 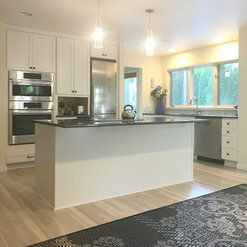 As a CAPS* professional through the National Homebuilder's Association, I am passionate about helping people reach their goals of creating a lovely, safe, and comfortable space, suited to specific situations for all the stages of life. I have helped others downsize, create ADU spaces, and orchestrate the project planning. *The Certified Aging-in-Place Specialist (CAPS) Program was developed by AARP and the National Association of Home Builders (NAHB) to assist consumers in making their homes usable for a lifetime—regardless of their age, size, or functional ability. By planning now, you can plan to "create your own mold", rather than fit into one. Certified as an Aging in Place Specialist, November, 2014 / Diana Zapata is a Volunteer Charter Board member of the Villages NW non-profit organization in Portland, Oregon - named as the "Best new non-profit organization in Portland" last year. Diana was recommended by a friend to help us remodel our downstairs bathroom to accommodate my 91 year old mother, who moved in with us this summer and who is wheelchair bound. Diana made many design recommendations, all of which have proven spot on. She put us in touch with and accompanied us on visits to various suppliers, helping us pick out everything from the bathroom vanity to grab bars. Perhaps her most valuable service was putting us in touch with a contractor and plumber who were willing to arrange their schedules to meet our need. From the time we engaged Diana until the project was done took about 6 weeks. Prior to contacting Diana, we couldn't find a contractor who could even start in less than 3 months. Diana is personable, professional and listens carefully. She remained very conscious of our budget throughout. We give Diana our highest recommendation. Diana was OUTSTANDING in helping me get a bathroom remodel done quickly at my farm home before a big family reunion. I loved that she is so down to earth, practical, patient and really has the ability to work with and through the construction folks to get things done.. She communicates well and is very professional in all aspects of her service and design. The whole project was effortless for me, which is what I needed! Thank you Diana. You have great insight, great design ideas and great people skills. Thanks for getting the job done. 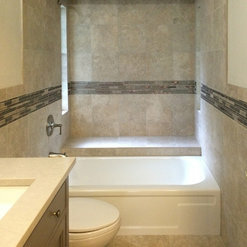 Awesome finished bathroom at a great cost too. Diana helped us with a partial bath remodel project. 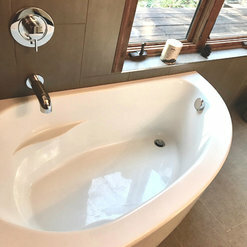 She was extremely helpful in finding a bathtub that would work in our narrow bathroom space, assisting with the selection of new tile and fixtures and lining up an experienced and trustworthy tiling subcontractor for the tile work. It was very apparent that she had a lot of contacts in the home design business and was well-liked and respected in her field. In addition to the bathroom project, Diana also helped us select the right gray color for a large room in our house and clearly had a lot of knowledge of the paint colors available from various paint companies. Thank you, Rebecca! I finally had some time this weekend to post some of the photos from your project. You were great throughout the whole process. It was fun getting to know you better - and I love the Neptune tub you ended up with. Maybe someday I will get one just like that one! I would recommend Diana to any potential client. 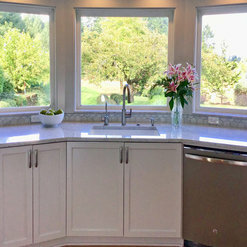 Her ability to coordinate the project and work with sub contractors helped complete the project with beautiful results. Thanks George, I always appreciated your artistic eye for great design, and the fact that you trusted me to take a few risks. The result was exactly what we all hoped for. Your job(s) were something to look forward to each and every time I was there. We hired Zapata Design about a year ago to help us with repurposing space in our home for my aging parents. 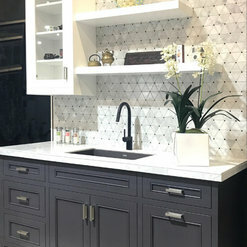 Zapata Design's representative and owner, Diana, was very sensitive, helpful, and creative in helping us to discover several design options to consider, and most importantly to select the design that we felt was best for us while staying within our budget. Cheers! Thank you, I think about you two often. I hope to make it back there again soon to see the new entry and simply reconnect. I had my pretty much my entire home redone by Zapata Design. Diana did a wonderful job. She listened to what we wanted and used her expertise to make everything affordable and practical while maintaining style. She also got some great people to work on the remodel. 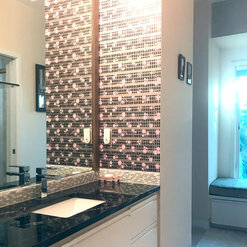 Focusing on the downstairs bathroom, here are a few highlights: 1. The frosted windows. 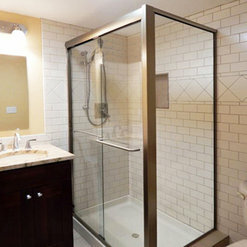 They make the bathroom bright where it was dank and dismal before, yet our privacy is maintained. 2. The new floor tile. It looks exactly like hardwood floor, which I absolutely adore. 3. The waterfall faucets. I wanted them badly, and I'm so happy that I got them. They really pop. And a bonus: Diana was able to find them for less money than I could. 4. Finally, she really opened things up. Before the remodel, the toilet was walled off, as was the shower/bathtub. This contributed to the dank, dismal feel that I mentioned and made the bathroom look really awkward. Now it's a much more welcoming space. Diana really brought out the potential that was always there in my home, and months later, I still have a "wow" moment every morning when I wake up and see how it's changed. Thanks for this wonderful feedback, Alexis. 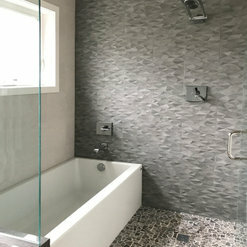 You have a beautiful home and it was exciting to include the textural Pental tile for the focus wall of your shower area. 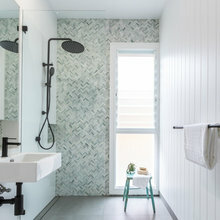 Those designer upgrades, such as the soaking tub, heated floors and waterfall faucets really make your bathroom a much better fit for your lifestyle. Enjoy! Diana is wonderful to work with! We have collaborated on several projects and I have found her to be a true professional and very easy to work with. Her design ideas, construction background and attention to detail are always appreciated. She is a very talented and knowledgeable designer that I am happy to “highly” recommend. Thanks Caryl - It is always a pleasure to collaborate together. I enjoy working side by side, because in working together as colleagues, it brings more strength and creativity to each project we approach. I look forward to our working partnership as time goes on. We are creating a solid design/construction team of dependable experts, and it is very rewarding. Diana was great!! !, it was amazing working with her, she understood the needs we had and worked by my side all the time until we delivered the proposal we were expecting. Thanks, I enjoyed working with you and hope to continue to create solutions for your projects in the months and years to come. Diana is the best. A friend recommended her to me, and I was so glad as I couldn't have done the job without her. She is a real pro. She knows her "stuff" and she knows the right contractors to employ to get the job done. She is very adept at juggling many balls at the same time and solving problems. She's a great communicator and a delightful person to work with! Jan, I have to say that you are the type of client all designers hope to work with. You had your criteria and ideas, and we listened to each other to come up with the best outcome possible. I also appreciate how trusting you were to have me oversee everything while you were gone. The best part is that we have become very close as a result. 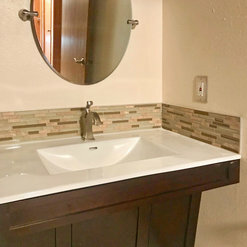 I hope you enjoy your lovely, updated bathroom for years to come. I had my entry hall floor re-tiled. Zapata Design did a wonderful job and was so helpful all through the project. Diana came by often to check on the tile work and worked very closely with the sub-contractor. She is a delight to work with and so accommodating. I was very happy with the final design. It's lovely. Every day I looked forward to your job, and getting to visit for a while. I am grateful that you decided to let me oversee your project, it was such a pleasure to work together. You were also very generous to refer me to another wonderful client. Thanks again for everything, Connie! Received a consultation/estimate but have not done the work yet. I contacted Diana because my 93 year old mother with Parkinson's is moving in with us. We are mainly concerned about her being a fall risk and needed to remodel our bathroom. We called Diana and she got back to us right away. One of Diana's greatest strengths is her ability to listen and address needs and concerns. 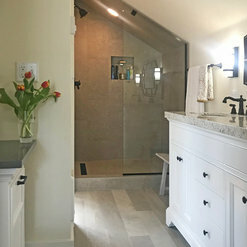 She not only designed a bathroom to meet my Mom's physical challenges, but she designed a bathroom that would be beautiful as well. She combines a great sense of functionality, style and color that is in keeping with our home. She also walked through the house with us and suggested additional assistive devices that would help my Mom in the bedroom, kitchen, etc. She pays attention to the details and with her experience, can see things that we need before we even know we need them. I would give her a 10 star rating if I could. Thanks Dawn, it was my pleasure to work with you and your mom. I look forward to finalizing your project when you think the timing is right. 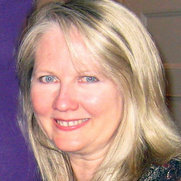 Diana is a careful listener who combines the practical aspects of aging in place with style, creativity and design. These qualities contributed to a lovely and livable home. Thank you, Lisa. I was thrilled when you called for this consultation. You have such a good eye for space and light, resulting in a welcoming home. Commented: Ceiling colorFor ceilings I LOVE Sherwin Williams Alabaster - just another idea.